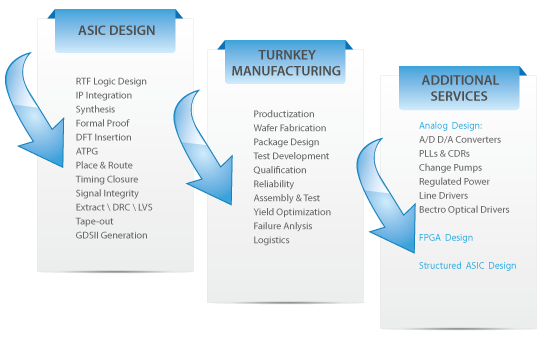 AAS provides comprehensive turnkey production services to customers, who have design capabilities and can provide a verified GDSII, but need support to bring the device to production and to handle the production supply chain. AAS has built an extensive network of strategic partnerships with a world-class foundries, assembly & test houses. Collaboration with the foremost industry vendors provides us with the resources to work together with our customers to develop a complete solution for products and to optimize the product's supply chain. Silicon Partners: Samsung, SocioNext, TSMC, IMEC, TowerJazz, and others. Assembly and Test Partners: ASE, Amkor, SPIL, Utac and others. We have established an integrated ERP system, which provides comprehensive information on yield, shipments, storage, production, and financial status. Our team demonstrates strong skills and knowledge in yield analysis and improvement, product engineering, packaging, and overall production flow logistics.